Ok, Friday is the perfect day for weird stuff. I don't know why but the thought of Emu Oil gives me the heebie jeebies. Maybe it is because I think of them as giant chicken and how exactly do you get oil from it? (Please don't answer that question!!) . 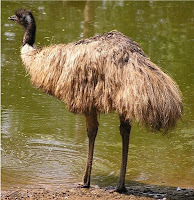 However that said, emu oil has become an 'it' product just as snail slime did for wrinkles. It is also one of those with historic use; Aborigines used it in medical preparations. I looked around for its use in hair and really there isn't much but it is actually quite popular in science. It has been shown to promote wound healing, with lotions containing emu oil (and some other stuff too) allowing wounds to heal faster. There are quite a few publications on this, so I'll just put one up as a reference (Plastic and Reconstructive Surgery, pg2404-2407, 1998). There are some suggestions too that it may also be antifungal, but I haven't found evidence to support this. I also can't say if it promotes hair growth which is actually a really common claim with this oil. Have you tried either of these, are they any good? I haven't tried either one but have been rather curious about macadamia nut oil so this post was right on time! It may be good for helping protect from sun damage? I believe avocado oil is good for this too. Hmm... I smell a "fun in the sun" oil blend experimentation about to go down! LOL. Yeah the thought about where the emu oil comes from grosses me out too. I don't know where it comes from and I don't want to use something that might cause harm to animals. I think that there are enough antifungal oils out there so its not worth it for me to have an emu die (if thats what happens) for my hair. Emus are killed for the oil. I'd never use it. But I would try macadamia nut oil. Macadamia nuts are so oily that they leave residue on your hands. It must be easy to extract the oil. I appreciate your professionalism and in-depth research of all these products. I love to see the references! This adds a whole new level to the world of blogging and I am glad you do what you do! Really love that you did this research. I want to try emu oil, but macademia nut is cheaper and has the same properties that I am looking for in an oil.